The Garaventa family of Concord, California, has long been a benefactor of Catholic higher education. The association of Mary and Silvio Garaventa with the University of Portland began in 1967 when their son, Silvio, Jr., enrolled on The Bluff. The family became close friends with University President Rev. Paul Waldschmidt, CSC. Subsequently two more of their children — Marie and Joseph — attended the University. Marie continues her association with the University through her participation in the advisory council for the School of Education. Joe is still remembered as a record-holding goalkeeper for the UP soccer team. The family legacy as active, committed Catholics came to include the work and projects of the University. 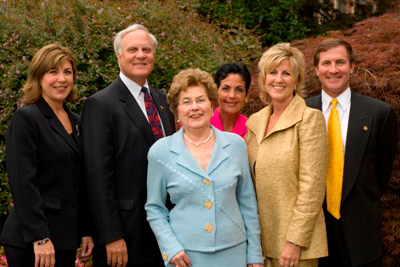 The Garaventas were major supporters for the construction of the Earle A. and Virginia H. Chiles Center, for Harry A. Merlo Field, for the addition of lights to Merlo Field, and for the renovation of the University’s main administrative building, Waldschmidt Hall — now named in honor of their longtime friend Bishop Waldschmidt. The Garaventa Center for Catholic Intellectual Life and American Culture was established as the gift of the Garaventa Family in November 2004, after the death of Silvio, Sr., to honor his legacy and the family's deep commitment to their Catholic heritage. The Garaventa Center was dedicated on June 2, 2005, at the opening of the inaugural Garaventa Conference — Teaching, Faith, and Service: The Foundation of Freedom.